The one and only meeting that did take place "at the right time" in a bare and humble cave up in the hills of Getambe in 2006, lasted from dawn to dusk, though he was very feeble and frail having had no solids for three weeks and no water for 10 days because "he had a problem with his throat and lungs and found it difficult to swallow". ‘The Truth is Unbelievable' is the result of that one and only "encounter of a different kind" between Venerable Bhikkhu Sumedha and dynamic Argentinian painter Cora de Lang. 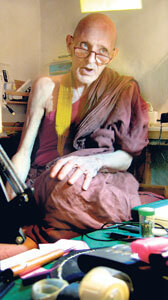 Bhikkhu Sumedha passed away when he was 75 years old. His body had been ravaged by cancers that he had overcome but when I met him he was after a bad bout of pneumonia, says Cora who is in Sri Lanka with husband Richard Lang, the Director of the German Cultural Centre. Cora had got to know of Bhikkhu Sumedha through Richard who had to read up about important and interesting people when he took up a new posting. "The first connection came when we saw a catalogue of the paintings of Bhikkhu Sumedha which had been put out by Deutsche Bank," says Cora, explaining that Richard had pointed out the similarities between those paintings and hers. However, later she had got an address and a phone number for his humble abode, Manapa Dassana Lena, hidden away from the madding crowds up 108 steps, in Dulwela village close to the Getambe Temple from Ven. 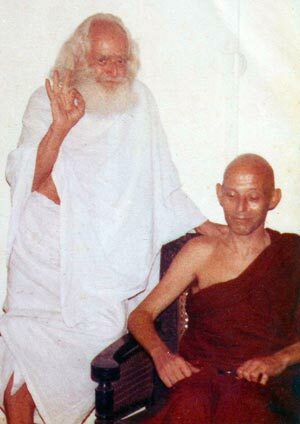 Metta Vihari whom they were in contact with. Richard, however, had gone to the cave earlier to invite Bhikkhu Sumedha to a conference and also to exhibit his paintings on the theme ‘Buddhism in Art' during the 50th anniversary celebrations of the German Cultural Centre. The monk while explaining that he was just a hermit had declined to attend the conference but agreed to the exhibition as he was "trying to paint the Dhamma". Painting for Bhikkhu Sumedha was a form of meditation, says Cora. "It was a spiritual exercise. He sacrificed his art to Lord Buddha." He indulged in some "incredible works where you could actually go inside the paintings" and did sell some of his works, while also giving away many to friends and relatives, but Cora believes that as an ardent follower of the Buddha he did not handle cash. He had made arrangements for the funds to go to charities and to develop the Intensive Care Unit of the Peradeniya Hospital. 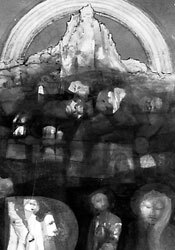 Although he agreed to be part of the exhibition to be held in August 2007, he clarified one small detail. "I will participate but I won't be there," he told Richard, who couldn't believe his ears. Soon after, Cora had an exhibition in 2006 at Barefoot and it was then that Bhikkhu Sumedha, even though he had never met her, laid down a small condition, sending an e-mail to Richard asking whether she would agree to be the curator of his exhibition. She was surprised -- it was a very Buddhist thing. Could she handle it? Why did he pick her? She was assailed by doubts. The exhibition was held in the meditation room of the Sambodhi Viharaya in Colombo 7, but he had passed away by that time, recalls Cora. If certain things were not meant to be they were not meant to be, she says adding that it was as if he was guiding the whole thing. She cites the example of a huge table that couldn't be taken out of the room. Wracking her brains how to deal with it she had decided to cover it with white cloth, bought metres of it and hired a tailor to stitch it up. The day before the exhibition when they attempted to fit the cloth, it just would not. Desperate she wondered what to do when an idea crossed her mind – why not use his robes and "that was perfect". Cora reveals how Bhikkhu Sumedha who was Aja Iskander, a good artist back home, across the seas, in Switzerland came to don the robes of a monk in Sri Lanka forfeiting all worldly comforts and living in a wet and insect-filled cave. Born to a German mother and Egyptian father, Aja had lived a comfortable life with his mother in Switzerland, after his parents separated. "He held a German passport but never lived in Germany," she says. Life took its usual course for Aja – he married twice, had children. "He was very fond of his grand-daughter," says Cora explaining that many were the visits they paid him in the cave. Suddenly, as young people do, he decided to travel the world and came to Sri Lanka. Getting into the whirl of Colombo's social circuit, it was at a party that something happened and he decided, "that life was over". He went to Kataragama, thinking he would become a Swami and lived in a cave there, only to realize that the only path for him was the path of the Buddha. Bhikkhu Sumedha was in touch with Ven. 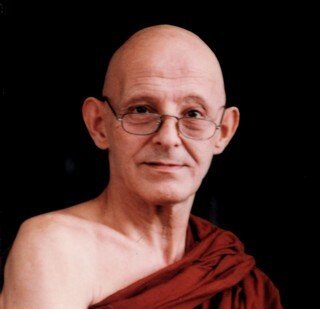 Nyanaponika – who was the editor of the Buddhist Publication Society – in Kandy and it was he who invited him to the Manapa Dassana Lena, earlier occupied by a German bhikkhuni. That was where he lived for 26 long years until his passing away. "He was very kind to simple people and helped the villagers, attending to their wounds," says Cora. The moment they entered, he started speaking. "He was expecting us," says Cora, explaining that he was sitting on his bed and in one corner of the cave there was a skeleton moving gingerly. When she gestured carefully that she would like to tape what he was saying he gave a sign that it was okay. 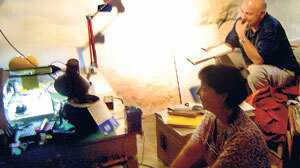 The simple cave seemed like a message……there was a bronze statue with the words scribbled on a piece of paper, "DNR" indicating do not resuscitate. Art installations were scattered everywhere. Even a small toilet constructed by Jagath Wijesiri who was by his side until the very end, had been turned into a work of art. "He saw in advance his death," says Cora who felt as if she was part of the process of accepting her own father's death. For 12 long hours he spoke, "heavy matter – non-stop", while they filmed and wondered how this frail monk could hold forth like this. "First part was more for us and the second a kind of message to the world," she says…..lot of material, speaking in German, English, Sinhala, Pali et al. As the evening shadows lengthened, they sensed he was tiring out and bade him goodbye, with the hope that they would see him again. But as they went down the steps, his voice rang out and still she hears the echoes in her mind …"Remember, remember, everything is anichcha (impermanent)". Cora knows of a wish Bhikkhu Sumedha had. 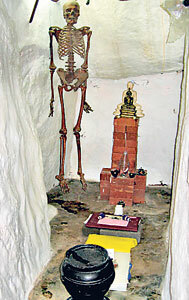 He wished to be known as that "Sri Lankan monk" and not a German monk, truly reflecting his love for this land. Courtesy: The Sunday Times (Colombo) of Sunday May 3, 2009.